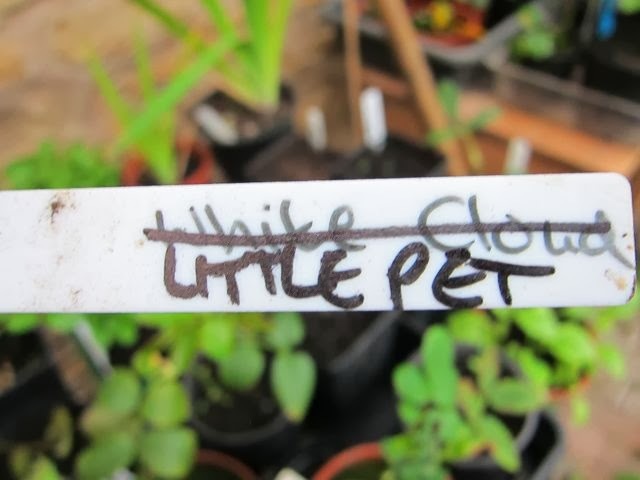 Labelling - it should be part of every greenhouse gardener's routine. 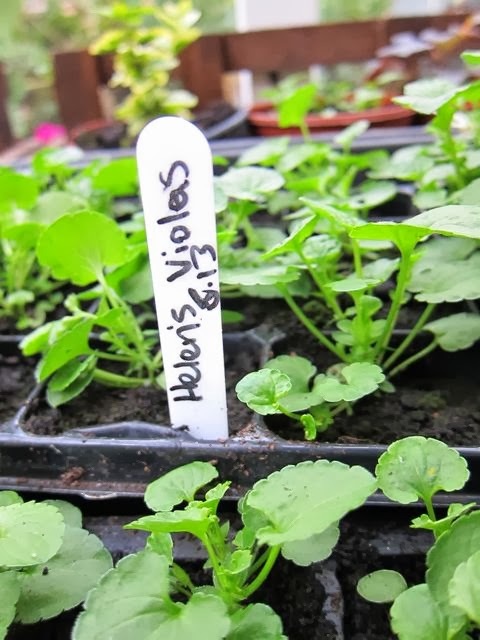 All plants should have their own label which is clear, correct and dated. Now, I don't have any problem reading that at all, in fact it is one of my better labels. It may look as if says 'shoe' or even 'Shop fiz', but I know it says 'Jude 5.13'! 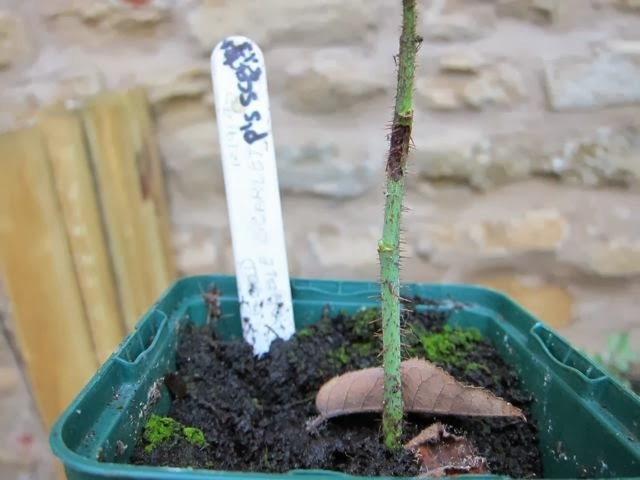 It is a cutting of the English Rose 'Jude the obscure', and is a rooted cutting taken in May 2013. A totally useless label, as the writing on the other side is unreadable, and the plant is clearly not a tree peony. 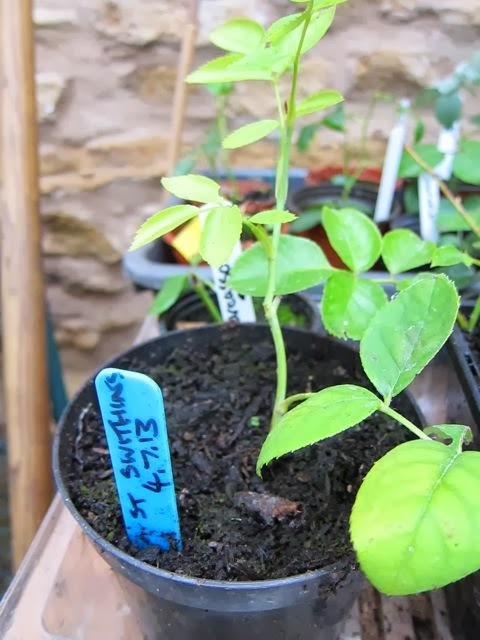 I know it is a rose, but haven't a clue which one until it flowers ! 'Love in a mist '?? I can't ever remember growing 'Love in a mist' ! Why is that label in that pot ? Totally bizarre - and I swear nothing in these photos has been moved or changed in any way ! 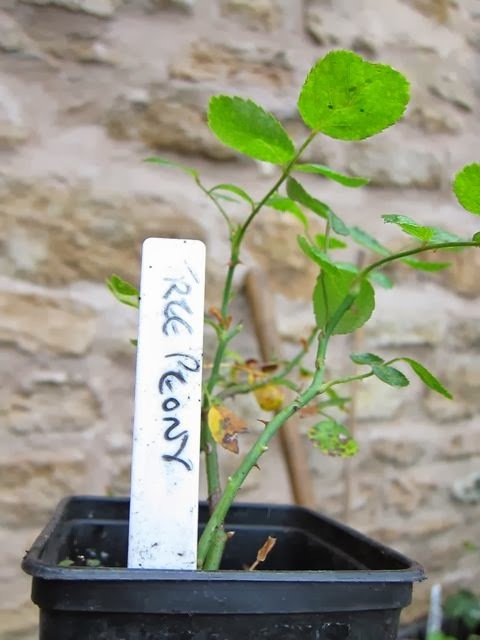 Again, the plants are clearly rose cuttings, and again, they will have to remain anonymous until they flower. The label situation is made even worse by my handwriting, which is bad at best, and at worse , atrocious, especially when written with gardening gloves on. It isn't that I have no new labels, I have a drawer full of them, and lots in my handy tin, ready to use. 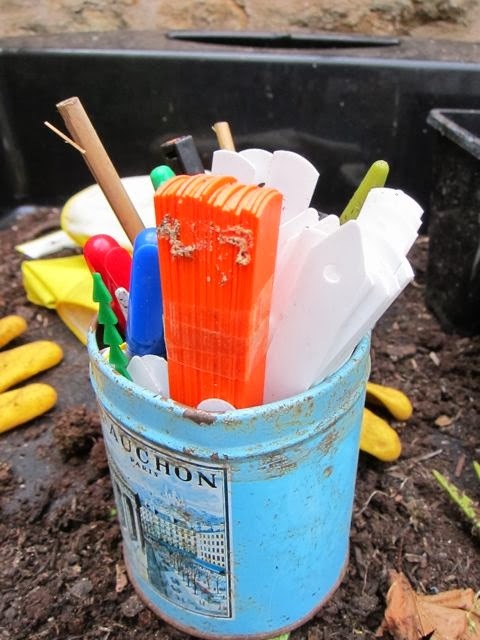 I have big ones, small ones, ones that tie on, ones that stick in the ground, different coloured ones, even , somewhere, some lovely (unused) copper ones. Yet still I feel compelled to get all the use I can from existing ones, before I reach for a brand new virgin label. If you look closely you can make out cobwebs on those labels. This one is 15 years old and it was my mum's, and it was for a geranium. 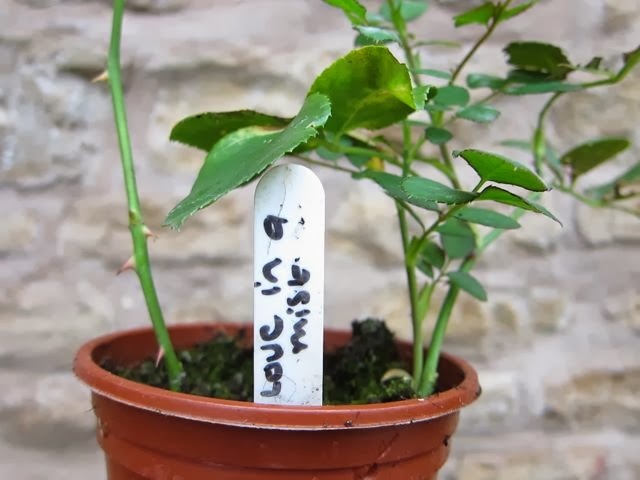 It is now in a rose cutting pot, with something indecipherable on the other side! Why do I bother ? Another problem I have is the fading pen. The label is crisp and clear when written, but fades to infuriating squiggles as soon as your back is turned. For those unfamiliar with fading-pen syndrome, it is 'Buff Beauty' - yet another rose. 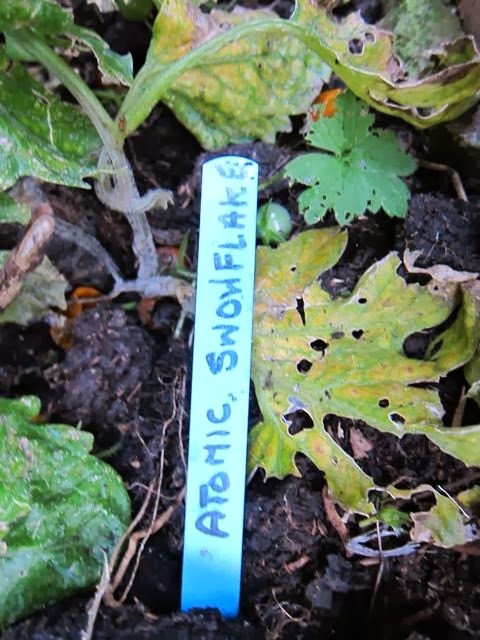 A label reading 'Atomic snowflake 'is currently lying next to the remains of a courgette plant. It is not in my handwriting, and I would bet it is not a variety of courgette either. My money is on a geranium, circa 1996 ! By the way, the other side is totally blank. The label above hardly inspires confidence, as I seem to have had a crisis of indecision when I was writing it. I also get a bit over-descriptive about some plants, especially if I am unsure of the name or variety. 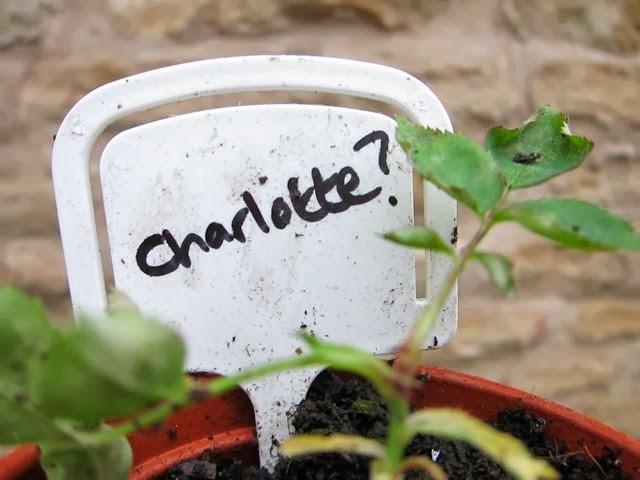 If plants are given to you by friends, often there is no variety known, and you need to invent your own name for them. Oh dear ! I wasn't even sure about this one at the time I took the cutting. 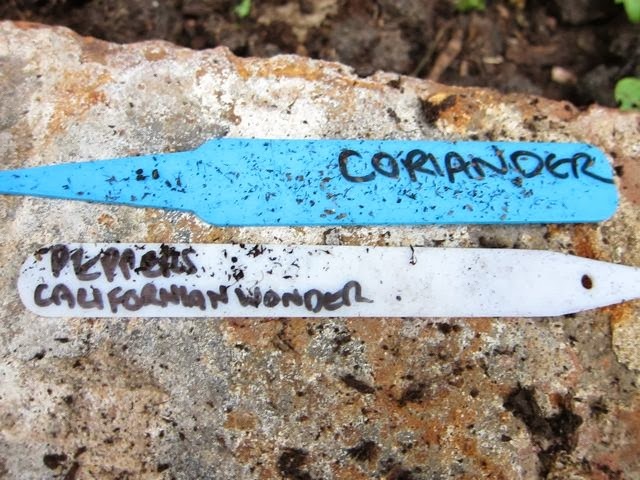 There is NO label next to my tomato plants, so I have no idea what variety they are, but I did find the 2 labels in the photo above, lying next to them. Needless to say there was no coriander or Californian Wonder peppers anywhere in sight. The tomatoes themselves are lookin' good, but will have to remain nameless. 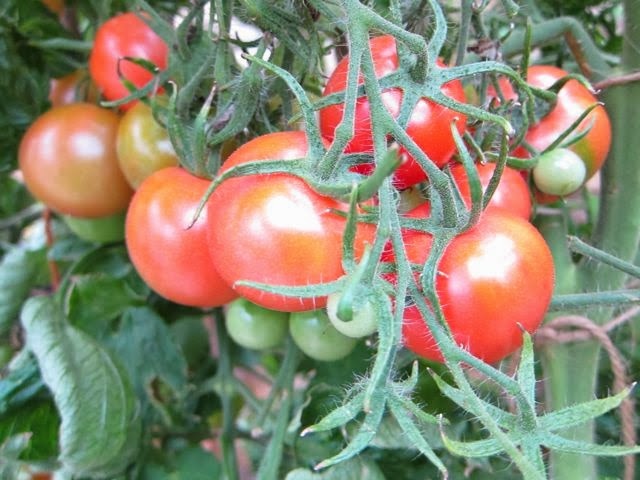 I tried 3 new varieties this season and I have a list of them - just haven't a clue which one is which. Occasionally, I get it right ! St Swithins has a label which is easily readable, dated and correct ! Better make the most of it ... a rose by any other name and all that ! Hahaha! This is a very funny (and reassuring) post! I do this all the time. 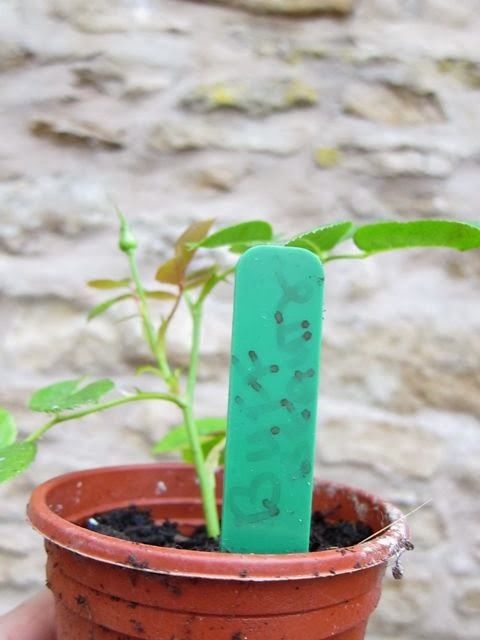 I hear Bob Flowerdew advising us to clean our labels in winter and come spring, mine all have 4 different names on them and I play hunt the right name for the plant, or add a fifth name in the absence of a correct label. I rather like my old labels; they are full of memories. Some of them belonged to my aunt and to see her writing on them always brings back happy memories of her and her garden. So glad I am not alone ! I too am fond of a lot of my labels and like to look through them occasionally, as you would look through old photos, just for the memories they bring back. I fell for those copper labels. They look WONDERful when freshly written, but give it a year, and they too blur to summingorother. My niece tracked down some wooden sucker sticks for me - and those currently ID the cuttings that are packing for False Bay. The copper ones look sooo good Diana ! I know some people 'engrave' them rather than write on them, which would probably last longer. Thanks for popping by my autumn post. Yes, the plant tag problem can become a nightmare when the winter frost pushes them out of the ground and the wind scatters them about. Not so bad in pots unless a grandchild changes them all around. Hmm ! That's where my system fall down ! Can't read my own writing !! I think I quite like my gardening history writ large on old labels though !! Funny post! Made me smile. You are obviously a woman of great inner strength with mental resources you can rely on in times of confusion. Hi Susan, thankyou for your vote of confidence. There are certainly many times of confusion ! Giggling all the way through, Jane! Your lack of labelling ability is obviously more than made up for by your propagation skills anyway. Hi Lyn, glad I made you giggle ! 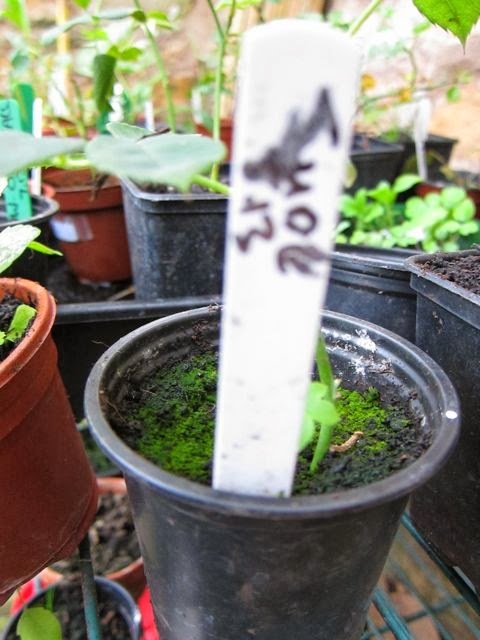 I'd rather propagate than write labels any day ! Hi Amy, I feel your pain ! Label and plant seem to work in opposition to each other and I too have my own little graveyard of labels in memorium ! Glad you enjoyed the post and thanks for your comments ! You had me chuckling! I could sooo identify. I keep nursery labels in a binder, but it is in desperate need of an update. 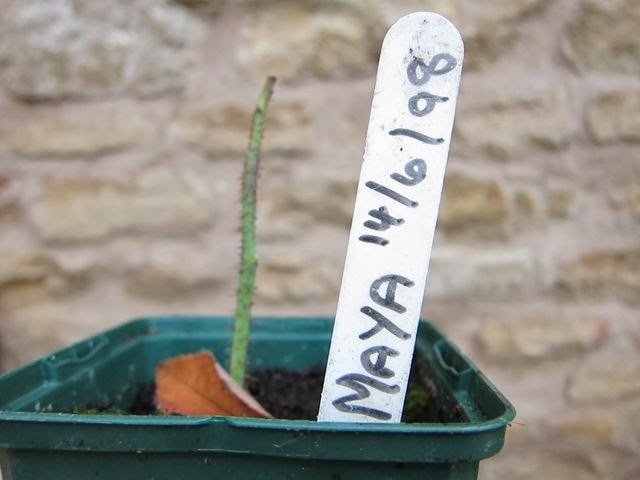 Many plants have passed on and yet I still have the label. Hi Jennifer, I get quite sentimental about the labels of the dear departeds ! I quite like a little trip down memory lane when I go through all the old ones .